Over the weekend I attended the Austin Blogshop, and words cannot express how delightful/awesome/fun/educational it was. If you are or ever want to be a blogger, I suggest you sign yourself up with a quickness. Along with all the learnin', there was a Smilebooth, , which led to several unfortunate jumping shots of my bare, pale midriff. The photo booth backdrop, however, was really cute. And you, too, can have one! The High Five Factory is making all manner of big, lovely custom-made backdrops (and props!) right over on Etsy. Also, they appear to be assisted by a really cute dog. So, I want them all. 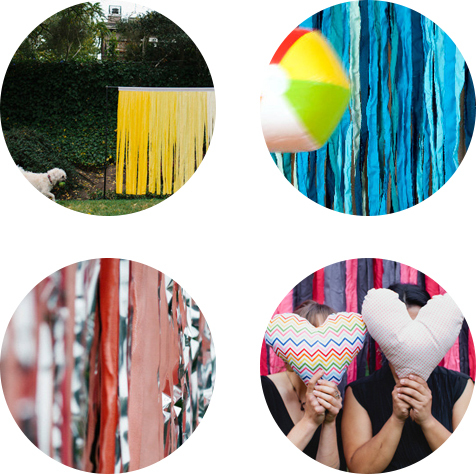 I think I will just set up a photobooth backdrop in every room of my house, and I will never want for headless photo (or midriff jumping) ideas. Right? Right.